The Text on this article was taken from Joseph Natanson autobiography book “The Creaking of the Gate”. I was happy when I was called to participate in the film, which was announced as one of the greatest of all time. Cleopatra directed by Joseph Mankiewicz. 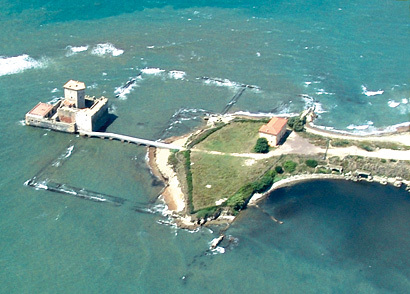 Not far from south of Rome, near the village of Nettuno, it was a very old small castle built on a rock in the sea, Tower Astura, connected to the mainland by a stone bridge, which is likely to replace the old drawbridge. Since it is a historic building and not even allowed to drive a nail on the wall without the permission of the Historic Preservation Commission for cinema. 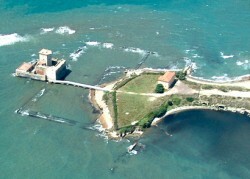 The castle was surrounded by iron scaffolding with a platform on the roof remained and they have placed two large windows at the right angle. On the one glass, to the south, you could see the sea and the beginning of the shore. 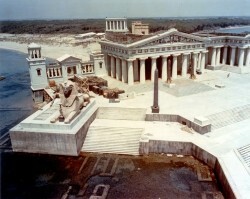 At the second, looking east, you can see the rest of the shore where they built the temples and palaces Greek Egypt style, with figures on the sides of the broad avenue. Naturally, temples and palaces were built only the lower side. My task was to complete the friezes, gaps, and roofs until the horizon, also paint some other buildings of Alexandria in the time of Cleopatra. All of this is supposed to be painted in those huge windows. At that time Mary Bone came to Rome. Excellent painter recommended by production, his arrival was gratefully welcomed. The task would be done faster working together. Autumn was approaching. 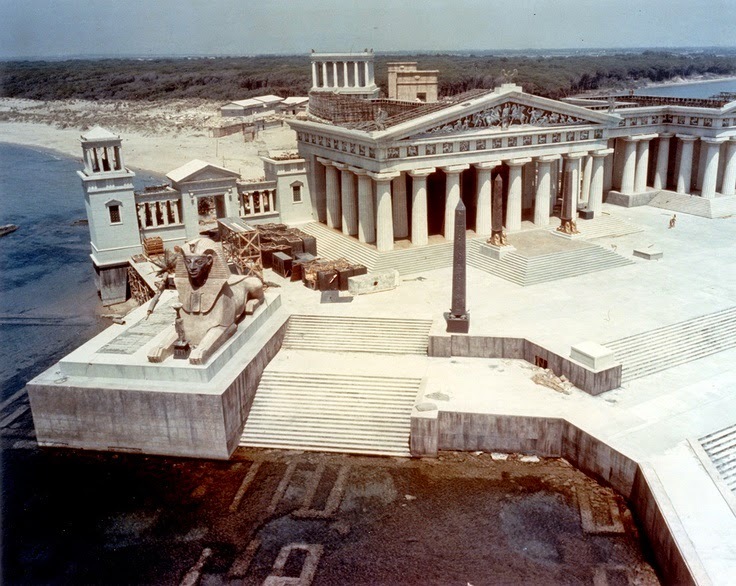 The first assigned shooting in Cinecittà was over, and later, in August they will come to Astura Tower. On that date we were ready. Even filmed two tests, confirming that everything fits perfectly, with small corrections. Meanwhile, two unforeseen events entangle it. 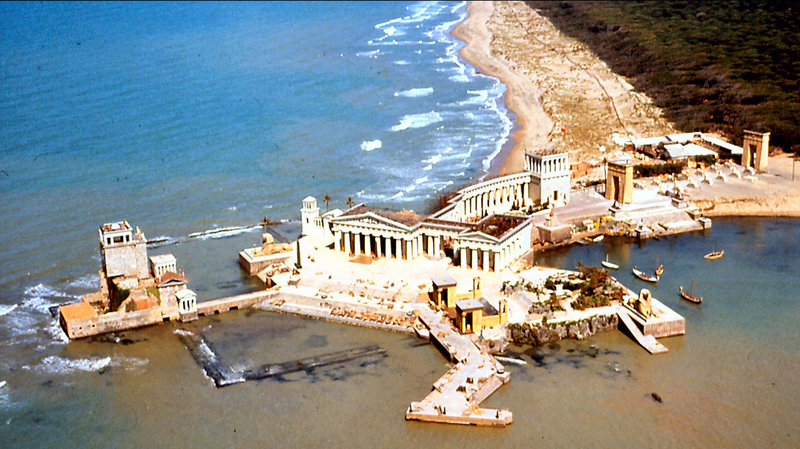 First Cinecitta ´s work extended much longer than was scheduled, and when all production team was already ready to go to Torre Astura, it started raining. Autumn came earlier than expected. Also came news of Elizabeth Taylor caught a cold in August, it was confirmed a few days later that she was seriously ill. There was no doubt that with that cold atmosphere she couldn’t play wearing those light Cleopatra’s costumes. It was decided to wait until the spring. Our carefully painted windows were surrounded by plastic curtains. Mary Bone returned to London, and I had other works to do and, I forgot about Cleopatra for a while. In April, when the sun was hard and jolly following spring I suddenly was called by the artistic director to come to Astura Tower. I thought probably during the winter our painting may have been damaged. He told me- which glass survived the winter very well, the problem is much more serious when I climbed the stairs leading to the platform. Glass actually survived very well, but when I looked through the viewfinder I understand all the drama. Like painted over our wider houses and temples, it appeared the mountains. Everyone knows that Alexandria is located in the Nile Delta and there are no mountains around. 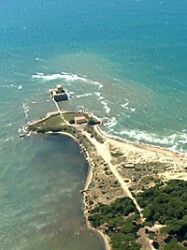 In late summer in Italy, autumn air is so immersed in the sea wet fog that you cannot see the distant Apennines. At the spring under the influence of strong northerly winds, the air is clean and our Alexandria became a mountain town. There is no other way unless to repaint it. The director and the stars, Elizabeth Taylor and Richard Burton they climbed to the platform to see the effect on our windows. I had to add a few more districts on Alexandria, in order to cover the top. And so, my life became very complicated, because I was called simultaneously for another rush job from another movie. Tight sleep schedule was established at the hotel in Nettuno, to get up very early and go to the paint job on the roof of the tower Asura. Already in the afternoon, I got into the car and went to Rome. On the way, it was a small restaurant I know where I had fifteen minutes to eat. I worked all evening in the studio, and so far I went home to be present at the dinner of Stefan and Phoebe and tell them a story for bedtime. Then calmly have a dinner with Ann, and sometimes with friends who have come. Then got into the car and drove to the hotel in Nettuno. Posted on 19 December, 2016 by Domingo Lizcano. Permanent link.